How do federal labor laws apply to your business and employees? Do you need to pay overtime? What about exemptions? Are breaks required? Is travel time work time? What happens during an investigation? Join us for this FREE SEMINAR and learn more about the Wage & Hour Division, ints enforcement of the Fair Labor Standards Act, and common violations to avoid. 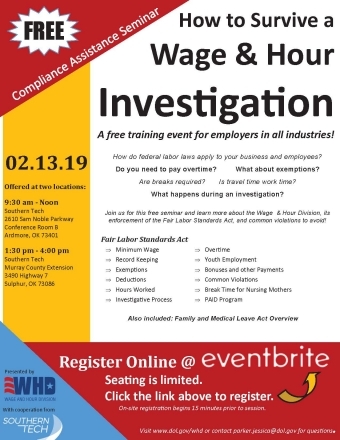 The seminar will also include Fair Labor Standards Act topics, as well as an FMLA overview. Class 1: 9:30am-12:00pm, Southern Tech, 2610 Sam Noble Parkway, Ardmore, OK, Conference Room B. Visit www.dol.gov/whd or contact [email protected] with questions.